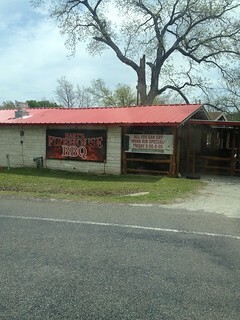 On my recent Texas State Parks day trip I stopped for lunch at a BBQ place in Lampasas, TX called Hart’s Firehouse BBQ. 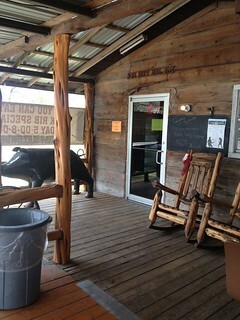 This joint has been open since 1965, with different owners along the way, and has a great atmosphere to go along with some good BBQ. It’s located at the intersection of highway 281 and Plum St in Lampasas, TX. We arrived right before lunch on Saturday and found ourselves second in line. The lady in front of us proceeded to order sandwiches for the entire staff of the city of Lampasas. As I waited in front of the “please order ahead for large orders” sign I took a look at the restaurant’s interior. It was a nice country homey place with plenty of seating and natural light. They have plenty of outdoor seating and parking which is always a plus. Once the City Office staff were given their order we were up to bat. The first thing I noticed about the menu is they seem to like their spice. This is good for me, but I can understand how some people wouldn’t like the extra kick. For those people, you probably shouldn’t stop at a place with fire in the name. I got the two meat BBQ plate with brisket and jalapeno sausage. The brisket was good brisket. The sausage was good sausage. Nothing to brag about, but good food. 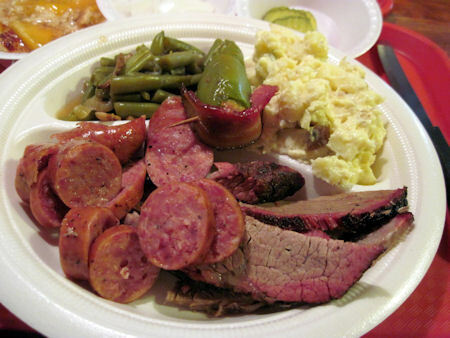 The green beans and potato salad (jalapeno potato salad of course) were pretty darn good. The jalapeno in the potato salad was a nice touch and wasn’t too spicy at all. The spicy sauce was excellent and I recommend it for the sausage. Overall it was an ok place to stop between parks/hikes. Having been to as many great BBQ places as I have had the pleasure of eating at, it is difficult to impress me when it comes to Texas BBQ. 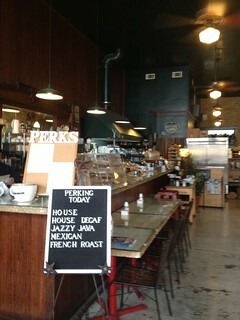 Another stop on my recent Texas State Parks day trip was to a nice little coffee shop in Lampasas, TX called Perk’s. We were greeted by the smell of good coffee and tea brewing and a smiling owner named Monty. We’ve had good luck finding great coffee spots on our trips and I’d have to say we struck gold once again. Along with a great iced tea, Italian soda, cafe americana, and an assortment of tea bags to choose from Monty also has a selection of pastries to choose from for a much needed sugar boost after the trip to Gorman Falls. It turns out Monty is a pastry chef by trade and just has the coffee shop on the side. His cake shelves were all empty though he proclaimed that they were all full this morning when he opened at 10:00 am. All the cakes on display were custom orders which were picked up promptly at the opening of the store. He did have some unique cupcakes available for us to try out. They were made with four different chocolates and had a chocolate chip cookie baked into the center. Try one…or two if you happen to stop in. I promise you won’t regret it. The date and location are set for this year’s Gettin’ Sauced BBQ Sauce Festival. September 28th at Hops and Grain Brewery in Austin, TX.